About a year ago, I helped design and run a workshop for the City of Melbourne, as part of Arup’s agreement to run a series of workshops for the C40 ‘climate leadership group’ of cities (the C40 is in partnership with the Clinton Climate Initiative, and is a consortium of what could be described as the world’s leading cities.) The workshop was free for each city, and they get to choose the topic. Likely to be of more interest is the final report that I produced for the City, and which emerged from the Melbourne Smart City workshop. I wrote this, with contributions from my colleagues Léan Doody, Volker Buscher and Mark Watts at Arup London, and Andrew Wisdom at Arup Melbourne. This in turn led to me re-writing it more broadly, to become Arup’s Smart Cities strategy in general. (Michelle Tabet at Arup Sydney also helped with this aspect.) Matt Willcox and Alex Fearnside at the City of Melbourne were also instrumental in shaping the report and preceding workshop. Additionally, I’ll go into the visualisation sketches that my team produced (Jason McDermott, Pei-Hong Jessie Hsu and I, at Arup Sydney.) Here's the report, as PDF (I was in the middle of a H+FJ Vitesse phase, as you’ll see). But the Melbourne work we did assumed that web, mobile and wi-fi are the easier things to get right—or at least that they ought to be—and focused more on the ways in which digital might manifest itself physically, in terms of informatics, urban spaces and architecture, as well as touching on the organisation of the city itself. This work should lead ultimately to a complete reconfiguration of what urban governance is, and although we couldn't go there with this, that was something we wanted to move the conversation gently towards. This is partly due to the paradox at the heart of the web - that internet-based 'digital-only' products are services are both immensely transformative yet easy to ignore, uninstall and move on from. Whereas internet-infused physical products and services may be intrinsically more valuable, due not least to the extra investment and invention required when working with atoms as well as bits. And civic services have an even greater value proposition—to public and civic life, and an overarching long-term responsibility in terms of citizens themselves. There should be more to Gov 2.0 than Web 2.0. Without understanding that, web and mobile services simply skate over the veneer of big, ugly problems like the city, without genuinely engaging. Or, as my colleague Bryan Boyer and I have taken to saying, 'matter matters'. You’ll see some core concepts, like the “CIO+” position, who uses ICT to address strategic goals within the city, as well as indications of how such technologies and their associated cultures may well change most aspects of how we live, work and play in contemporary cities. In particular, the report is oriented towards enabling low carbon urban activity, as both climate change mitigation and adaptation strategies. It suggests changes in architecture and infrastructure, operations and maintenance, and the core interfaces with citizens. This takes it well beyond (pointless) smart meters and into the infrastructure of everyday life. It’s peppered with case studies throughout, in order to give the intended recipients (City of Melbourne; policymakers and officers at C40 cities) the sense that none of this is science-fiction—even though, in reality, there are still very few working examples of these ideas deployed strategically. Those who don’t deal with city councils regularly may not realise how foreign some of these concepts can be. Those who have never tried to genuinely pitch urban informatics at city CEO level may not realise how difficult that foreign and untried aspect makes it for cities to commission such work. Much of what you see described as ‘urban informatics’, ubiquitous computing etc on the internet—which is really student work or other academic work, or client-less proposals by design shops—would not make it past a real city’s natural defences against such things. Often quite correctly. Hence the time taken to outline the strategic imperative for cities (and this report is really only the tip of the iceberg in this respect). Note also the strategic roadmap, which pins smart city work over a rough timeline and within the context of existing city strategies (which is absolutely crucial, and we didn’t get it quite right here, I must say). However, the report falls short of getting into the genuine value cases of investment and return, which is a serious shortcoming that hindered its progress - albeit unavoidable in this particular job. Anyone who’s seen me speak in the last 18 months or so will recognise phrases like “IT is too important for the IT department”, which is at least explained here, alongside numerous other points around the importance of soft infrastructure, working with information at the civic scale and not just the individual, “data as the connective tissue in urban systems”, and so on. There are also many open questions, including some suggesting that the very form of urban governance itself will need changing, a thought continued into my current work. Having pursued this work for three or four years now it’s impossible to underestimate how difficult it is to get smart city strategies through. As with the built environment business, there’s little innate incentive for innovation within government—in fact, quite the opposite. And this is hugely challenging for clients (in this case, city governments.) When I noted earlier it could lead to a complete rethinking of what urban governance is, that's the last thing they want to hear. What seems an appealing train of thought to the external designer is probably heading to completely the wrong station, as far as the client is concerned. Their life is going to get more fluid, more complex, more disruptive, even more responsive? No thanks. Short-term political concerns are far more powerful drivers in the first instance, as are realistic models given the higher investment (in every sense) required 'when matter matters', and this is something many working in and around urban informatics are yet to understand. To put it another way altogether—and perhaps in somewhat glib fashion—it's easier to crowdsource a revolution than a light-rail system. (See related discussion here.) This is because projects like infrastructure are not simply about short-term political capital gain, but also long-term responsibility (and financing models) including the ability to make long-term investments. This requires a far more refined understanding of politics, citizenship and public life than is usually seen in either smart city or 'internet of things' rhetoric. Not understanding this, and seeing the influence of social media in the recent 'Arab Spring' revolutions, have led some commentators to overestimate the usefulness of social media in collaborative decision-making about the city. This, from the person that wrote about emergent urbanism and bottom-up planning. And I believe in that idea too—the recent initiative to use Kickstarter to create funding for a feasibility studies into the materials for a public swimming pool in the Hudson River is particularly interesting. I can't wait to see how that turns out, and wish it luck. But the problems with this approach are evident in the other Kickstarter-project-du-jour, the Robocop Memorial for Detroit (an excellent account is at Domus.) Here we see an attempt to take a well-meaning, entertaining and intriguing idea and spin it into physical space irrespective of whether 'Detroit' wants it or not. Read Nate Berg's article and you find that some people in London, for example, essentially think it's funny that a Robocop Memorial might end up in Detroit. This dislocation between action and responsibility, easily enabled in this case by micro-financing and social media tropes, may be fine if the only collateral involved is a movie, a website, a book or comic, as with most Kickstarter projects. But as it begins to move into civic space, something else needs to kick in, to connect action to responsibility, connect democracy and public interest to funding sources. These small vignettes suggest the deep currents moving through some cultures, but also the danger of not understanding that, well, matter matters, or that government itself may need to re-assert itself post-internet-of-things, rather than be disintermediated. A richer form of governance could be part-enabled by a collaborative, networked platform, but something attuned to shared physical space and shared responsibility—more Brickstarter than Kickstarter—but there's more to it than software. I'm not saying we got there with this workshop. But we used informatics as an 'alibi' in this workshop, in order to move towards that conversation, rather than making informatics products and services the ultimate goal of the work. That seemed to be the right thing to do, in terms of avoiding a technology-led discussion. The great Brisbane-based architect Timothy Hill said, “One third of my job is persuasion.” I feel the same. It’s a truth of being a designer that is rarely taught at school, but unless you’re the kind of designer that sits and waits for the brief to come to you, and then unblinkingly delivers to that brief (and really, what is the point of that?) then you’re involved in persuasion for a huge amount of your time, ideally about a better brief, to begin with, than a better solution, but persuasion nonetheless. This particularly applies in areas on the edge of new disciplines, new ways of living and working, new forms of organising society and culture. Which all of this is. Having said that, they worked well as A3 boards on foamcore, offering a kind of easy tactility and malleability; people were even able to scribble additions and comments on them, hold them up in discussion, spread them out over the table etc. They were open in that sense, and were another example of the value of exploratory sketching in collaboration. Jason and Jessie did a lot of the work on many of the following Melbourne-based mock-ups, with me design directing, though I had a direct hand in a few too. It should be noted that we were quite unusually screen-focused in our work here. I’m usually in favour of avoiding urban screens wherever possible—research indicates they are largely ignored by citizens, and you can see why—and if one is using displays at all, to work within the context of architecture, as per our work with Low2No, such that it shares the architectural vocabulary of a building or space, and is genuinely integrated. Timothy Hill (again) would always test my ideas for the State Library of Queensland by getting me to think more in terms of sculpture, or articulated physical objects, than screens. And I’m entranced by the ideas of Mayo Nissen and BERG in terms of retrofitting old infrastructure (paper) with new data. Similarly, my team and I were extremely concerned with getting data visible, with systems showing their seams in useful fashion (and building on some old thinking here), and with getting data away from personal, individualising mobile screens and into civic space (whilst respecting privacy, security and right to anonymity, it goes without saying.) So this meant more of an engagement with physical and architectural representations of data than simple web-based views rendered for screen. However, with the workshop in mind, one implication we wanted to make clear was that the following could indeed be retrofitted to existing spaces and buildings. In reality, that is a tough proposition; but this was for a workshop exercise helping the City critique the concept, positively and negatively. So many of these are screen- or display-based, despite our better instincts, though there are a few exceptions like Jessie’s water sculpture, which borrows a little from Ratti et al’s Water Pavilion, yet uses projected light to make visible water quality. Similarly Jason’s ‘net’ installation idea is hung above Federation Square—I’d suggested building on existing spaces for public art, and working within the near-iconic ‘Melbourne laneway’ form, and we’d sketched out the idea of addressable lights embedded into cables forming nets on an earlier project proposal in San Francisco. We’d done lots of work around mobility-related interfaces for public transport environments—principally for the Sydney Metro project in 2009-10, which I’ll post separately—and here we saw examples to deploy real-time transit network patterns into a form of loose-fit signage, projected throughout the city, as well as intensifying at bus/tram-stops, building on the existing displays to offer bolder visual language, as well as switching actual language for tourists or ESL residents. We also couldn’t see why trams themselves shouldn’t get a piece of the action. These various mobility-based visualisations, including a mobile delivery system on augmented bikes, are by me. Similarly, the screens that Jessie designed to hang outside apartment blocks or municipal buildings are a little rudimentary on purpose, produced quickly to generate discussion as to the value of conveying a block's overall performance—in terms of behaviour change amongst residents or observers. The 'urban dashboard' indicates a tacit attempt to appeal to the client too, by giving them a sense of what kind of data such an approach might generate (here, modelled for a sustainability officer) as well as how it might integrate with existing office systems like Outlook and existing data-sets and applications within the organisation. Elements of this to be projected in elevators and lobbies, squirted to mobile apps etc. Fast-moving data (from sensors, web etc) is at the top, slow-moving data (from census etc.) is towards the bottom. (I rapidly mocked-up the dashboard i about an hour of Omnigraffle and then pasted-and-transformed into Photoshop, and it shows somewhat. It draws from City of Melbourne's current identity.) The 'Activity Monitor' is by Jason, and indicates potential output from our mobile phone monitoring prototype (a real project). Putting the screenshots into the context of monitors in a generic office setting (actually from colleagues’ desks at Arup Sydney.) was another tactic to make it everyday and now, rather than The Future. The physical installation is perhaps most extreme in the moving bicycle sculpture across the roof of this made-up bike garage. Another one of mine, this is actually built on an image of a vacant lot next to Federation Square—please excuse my formulaic ‘architecture’, or faceted, Fed Square-style Melbourne ‘talkitecture’, but that was hardly the point of this sketch. The ‘building’ was constructed from some nicked bits of facade from Federation Square proper and heavily processed in Photoshop, after a couple of false starts in Sketchup. Here's the 'building' before and after. Don’t give up the day job etc. Here, the position of the giant bikes relates to how full the bike garage below is—I like the idea of them as neon and metal tubular elements (like many signs in Melbourne from the 30s to 60s) slowly cranked across the roof. Slightly awkward, distinctly mechanical; analogue representation of digital approximations of analogue activity. They’d look great at night, which is the idea to be discussed here—to assess the possibility of data viz as urban spectacle, as well as ‘useful’ at-a-glance from-a-distance interface. How would the city handle this kind of 'architecture'? Cyclists who can't see the landmark viz are aided by a distributed set of small signs on cycle routes and intersections, telling them which garages currently have most spaces. The night shot (above) is made from exactly the same photo, and heavy use of Levels and Burn tools in Photoshop, with a slice of blurred car-taillight-smear as an accent (taken from a photo elsewhere in Melbourne, adjacent to this one), and with a few stars and street lights added by hand. Finally, in terms of further ‘design fiction’ (sort of), the fake newspaper is something I’ve done on most projects over the last few years (actually continuing an idea we developed at the BBC in 2005, where I made a fake copy of The Economist for the BBC’s strategy to 2015.) 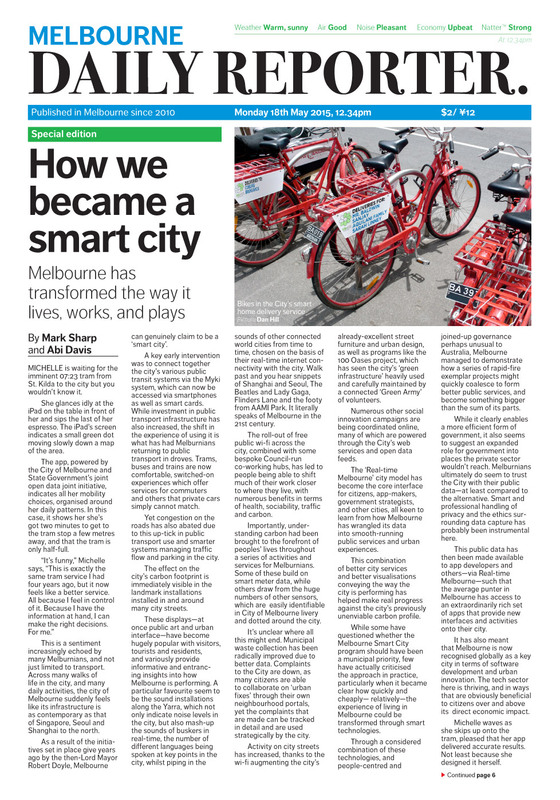 Here, the poorly disguised copy of local paper The Age—the Melbourne Daily Reporter no less—puts the smart cities rhetoric into something plausibly everyday, helping the City understand how it might be communicated, as well as its value. It's a useful test to consider whether your design, service or strategy, could be plausibly conveyed in a newspaper article. It's also a good test for the designer to be able to convey their ideas through this kind of writing.